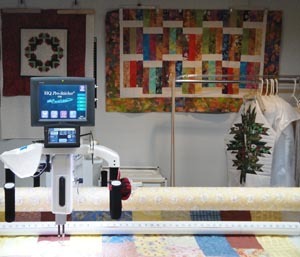 TBdecor is a Longarm Machine Quilting Service located in Palatine, a northwest suburb of Chicago, Illinois. I specialize in longarm quilting and operate a professional INNOVA longarm machine. This machine is state-of-the-art with automatic stitch regulation to accomplish precision stitch size for the highest quality results. The computer guided Intelliquilter allows me to use thousands of unique digital pantographs (edge-to-edge), motifs, and border designs to match any theme and enhance the final product. I take pride in offering a stitch regulated, computerized quilting service for your family heirlooms and treasured gifts. I hope you will consider giving me a try. After all your hard work, your keepsake should be appreciated and enjoyed. Take advantage of our low pricing on pantograph quilting today. Receive a $20.00 TBdecor gift certificate for every new customer you refer.